Got a few potatoes in hand and need a quick side for dinner or a snack? 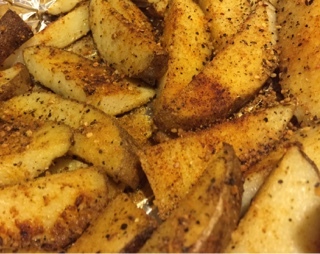 Cut potato in six-eight wedges, toss in olive oil, salt, pepper, garlic powder and smoked paprika and put on foil-lined baking sheet or pan. Other options are ranch dressing powder, barbecue powder, or lemon pepper seasoning. Bake at 400 degrees for 25-30 minutes. Serve immediately with your favorite condiments like ketchup, barbecue sauce or ranch dressing. Tomato Garlic Cream Pasta is a quick and tasty meal for weeknights that will satisfy and delight your taste buds. The sauce is tomato sauce, stewed tomatoes, (though you can always use a store bought sauce-if I do, I like Prego), oregano, basil, garlic and onions sauteed. Add cream, butter, grated Parmesan cheese and cream cheese. Salt to taste. In a separate pan sauté vegetables (I like eggplant, onion, mushrooms and red bell peppers) with olive oil and garlic. Salt and pepper to taste. 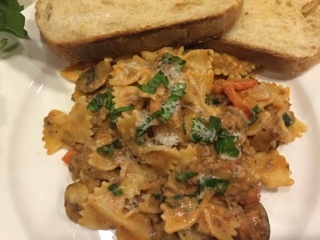 Toss cooked pasta, vegetables and sauce together. Add Parmesan cheese and chopped basil.